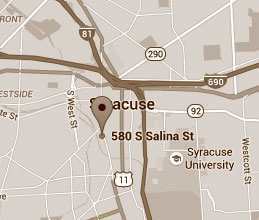 Personal Injury Lawyer Syracuse NY. McMahon, Kublick, P.C. With experienced dedication to accident injury, workers compensation and social security disability matters, McMahon, Kublick, P.C. is committed to helping our clients and their families reach the best possible outcome in their personal injury case. Founded on 1977, McMahon, Kublick, P.C., is one of the oldest and most trusted Syracuse accident injury law firms in Central New York. Since opening our doors in Syracuse in 1977 we have built a reputation as the ‘Peoples’ Lawyers.’ Whether you have been injured in a car accident, hurt on the job, injured in a nursing home, or become disabled and unable to work, you can count on the our dedicated, caring team to work on your behalf. Over the years, we have collected more then $200,000,000 in settlements and verdicts for our clients – people just like you. All of our personal injury cases are handled on a contingency fee basis, meaning that you never have to pay any legal fees until and unless we are successful in recovering a verdict or settlement for you. We exclusively represent individuals who have become injured or disabled, and their families. We never represent insurance companies, like some injury firms, therefore you have the peace of mind knowing that when we take on your case, your interests always come first. We take a no-nonsense, direct approach in handling your case. We stand up to the bullying insurance companies and heartless big business on your behalf so you can concentrate on the most important thing – healing and getting your life back. Our ultimate goal is to get you the compensation you deserve; and in the end to ensure that you live your life with dignity following an injury. Our clients come from all walks of life. No case is too big or too small. Over the course of our nearly 40 years representing injured clients we have seen it all, from work accidents to car accidents, to dog bites to medical malpractice claims. In doing so, we have developed a team of lawyers and experts who use tenacious cutting edge strategies to advocate on your behalf. Experience truly does matter. Our personal injury law firm was found on the principle that clients are best served by giving caring, dedicated personal attention. When you speak to an accident injury lawyer at McMahon, Kublick, P.C., in Syracuse, NY, chances are you are speaking to one of the founding partners of the firm, who grew up and has spent their lifetime practicing law in the Syracuse and Central New York community, who remembers your name, works actively on your case, can answer all your questions and direct you to a successful resolution of your case in an atmosphere of care and confidentiality. INTEGRITY, COMMITMENT, EXPERIENCE, COMMUNITY — IT’S THE MCMAHON, KUBLICK, P.C. WAY.